Modeled on Thackery's Becky Sharp ('Vanity Fair'), she is one of the best known characters in American literature - Spoiled, single minded, tough as nails, and just plain obtuse, she set her cap at one man and ignored the one who could have made her happy. Margaret Mitchell's epic novel 'Gone With the Wind' chonicles her story and the tale of the United States Civil War and its effects on the south. 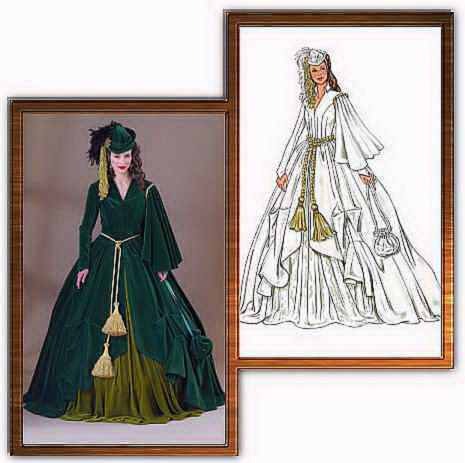 #V120 This gown is modeled on the "Green Portier" gown worn by Vivien Leigh in the classic 1939 film version of the novel . It is fashioned of 28 yards of dark green velvet with overskirt, bodice, and hat with a lighter green underskirt (the skirt edge measures 9-1/4 yards) . The costume includes hat, bag and tassled belt. This gown is meant to be worn with a Victorian Corset, Hoop, and Petticoat .